When you procrastinate, it is because a part of you doesn’t want to do the task because it is afraid of the consequences. These fears are usually unconscious and come from unresolved childhood pain. Taking Action will help you to understand what is behind your Procrastination, and more importantly, it will help you work through your fears so you can accomplish things. It will help you set up a practice for overcoming procrastination and taking action on projects and disciplines needed for your life to flourish. Do you find yourself avoiding important tasks? Is it hard for you to make decisions and take action to move your life ahead? When you are faced with a project you have decided to work on, do you get distracted or busy with other tasks? Is it difficult for you to discipline yourself to exercise, meditate, eat well, or something similar? If you answered yes to some of these questions, you are one of the many people struggling with procrastination. You are unconsciously avoiding tasks that are important for you. Crucial actions get put off or forgotten. Despite the best of intentions, you can’t move ahead with the projects, plans, or actions that would be helpful for your life to work. Perhaps you keep putting off an assigned task until the very last minute, and then you pull an all-nighter in order to finish it. You pay the price of stress, lost sleep, and doing a poor job because of the rush to get it finished. Perhaps you perpetually finish assignments or projects late, and you lose the respect of your coworkers, teachers, or boss. Procrastination can cause serious problems in your work or your studies. It can make it difficult to initiate action to change or advance your life. It can keep you stuck in a quagmire where your life is on hold, leading to hopelessness and depression. When you procrastination, it is because a part of you doesn’t want to do the task because it is afraid of the consequences. These fears are usually unconscious and come from unresolved childhood pain. You’ll be able to complete important projects that lead to advancement in your life. You will be able to make crucial decisions and take the risks to change your life. You will no longer be held back from the success you deserve. You’ll be able to achieve your goals and dreams. This book is based on the Pattern SystemTM, a comprehensive and detailed map of the human psyche. 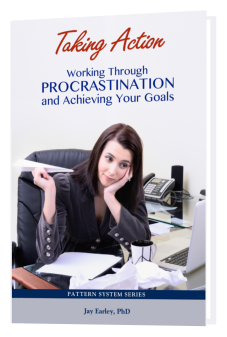 This is a great book on how to effectively overcome procrastination. Jay Earley provides an easy to read and thorough understanding of what holds us back from taking action and how to overcome it, resulting in a sense of ease with work. I found this book realistic and informative. What sets this material (and others in this series) apart is an online workbook that can be completed while reading through the book. The workbook includes questionnaires, meditations, and content that complements the text. Using the online app, I worked on a project I had been putting off for quite some time. I was surprised how well the process worked and was able to complete the task in one sitting. Once I got started I felt an unusual sense of ease that spanned several hours of work and a sense of accomplishment when finished. I will definitely use this process again.